A Japanese space probe yesterday landed successfully on an asteroid 340 million kilometres from Earth, as three home-grown firms including Japan Airlines (JAL) announced their foray into the nascent space exploration industry. 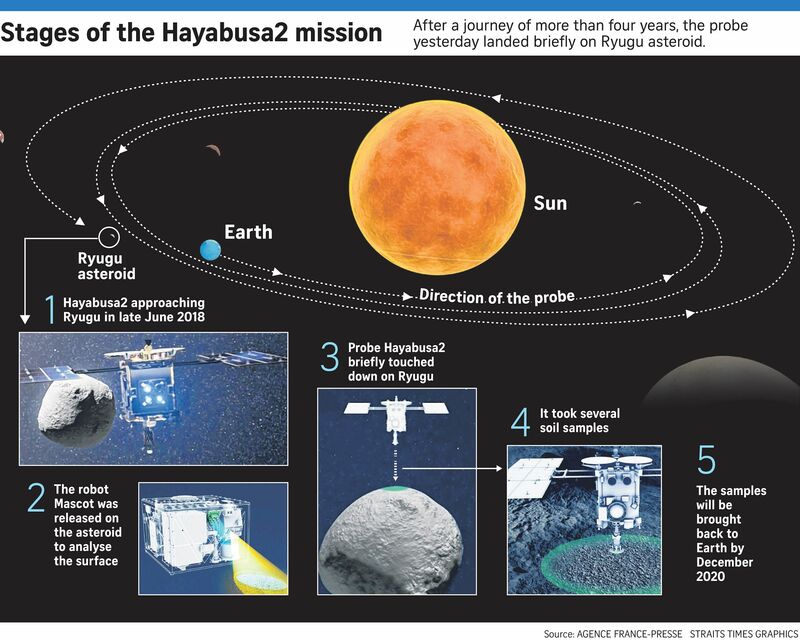 The Hayabusa2 spacecraft, launched by the Japan Aerospace Exploration Agency (Jaxa) in 2014, not only landed briefly on the asteroid Ryugu at 7.29am (6.29am in Singapore) but collected debris from its rocky surface. Hours later, Japanese lunar exploration start-up ispace, which is working with US entrepreneur Elon Musk's space venture SpaceX, announced new partnerships with JAL, Mitsui Sumitomo Insurance and manufacturer NGK Spark Plugs. Their aim is to send a rover into the Moon's orbit by next year, and land a probe on the lunar surface in 2021. These parallel moves by both the Japanese public and private sectors reflect the growing interest in a burgeoning space industry with many companies seizing on what they consider to be the country's competitive edge in advanced, precise technology. Hayabusa2, which weighs 600kg and is the size of a large fridge, yesterday fired a bullet into Ryugu's soil to loosen and then collect the surface debris. Scientists say the material has been uncontaminated by the elements since the dawn of the solar system 4.6 billion years ago. The collected samples will be brought back to Earth for analysis by the end of next year, when Hayabusa2 is due to complete its six-year odyssey. Scientists believe that examining the samples from Ryugu - named after an undersea dragon palace in Japanese folklore - will unravel mysteries of how life began. "The hands of humankind have arrived at a new celestial object," said mission project manager Yuichi Tsuda. "The touchdown was in the best condition and as desired." The mission was significant because it was conducted autonomously in a delicate operation that Jaxa likened to "landing on a pitcher mound in a baseball stadium from a height of 20km". Jaxa's success was hailed around the world. The US space agency, Nasa, which itself is on a mission until 2023 to collect samples from another asteroid Bennu, said it was "looking forward to comparing data and sharing samples with Japan". Chief executive Takeshi Hakamada, from the start-up ispace, lauded the achievement as remarkable. "As technology for planetary exploration becomes established, and the know-how of private entities actively tapped, new industries can be born." In announcing the new partnerships, he said JAL's facility near Narita International Airport would be used to assemble and test the lunar landers under ispace's Hakuto-R programme. JAL will also help transport the landers to the launch site. Mitsui Sumitomo said it planned to provide lunar insurance coverage for companies and individuals so as to mitigate the risks of space exploration and to further develop the space industry. Its managing executive officer Isao Nojo likened this to when marine insurance was developed in the mediaeval era to protect voyagers and seafarers. NGK, meanwhile, is developing solid-state batteries as a potential energy source on the Moon. These batteries will be transported as cargo when ispace lands its probe in 2021 in what will be the world's first tests of such technology on the lunar surface, where temperatures can reach lows of -150 deg C at night.